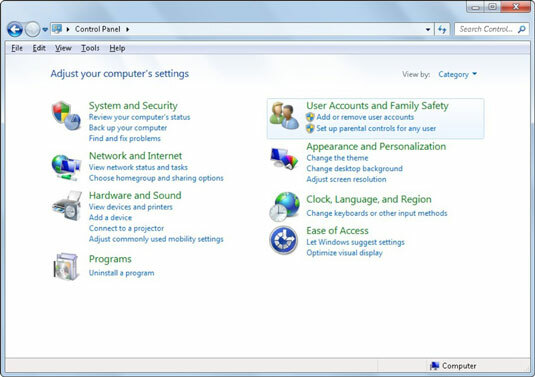 Open the Windows Control Panel, and then click User Accounts and Family Safety. The User Accounts and Family Safety window appears. The User Accounts window appears. In the left pane, click Manage Your File Encryption Certificates. 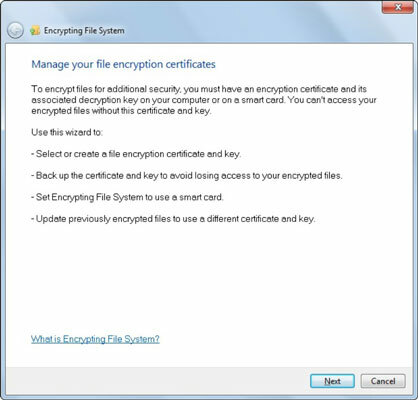 If this option isn’t listed in the left pane, you haven’t yet set up an Encrypting File System (EFS). Refer to Windows 7 Help for further details. In the Encrypting File System dialog box, click Next. 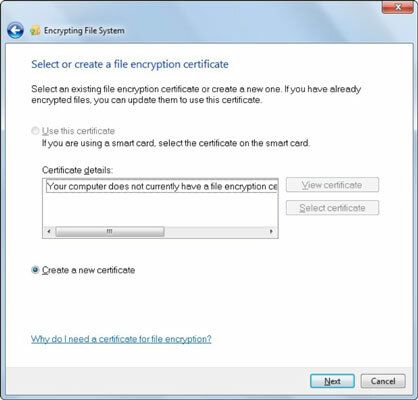 The Select or Create a File Encryption Certificate screen appears. 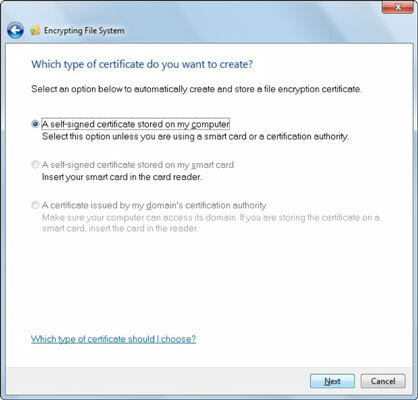 Next, you choose which type of certificate you would like to create. Select A Self-Signed Certificate Stored on My Computer and click Next. 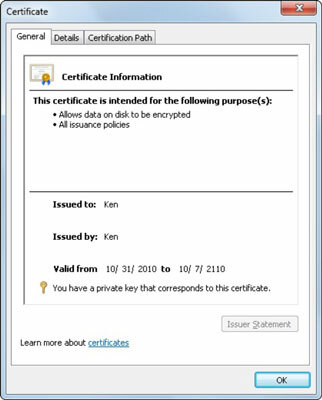 Windows creates a certificate for you. Click View Certificate to view the certificate. The certificate and its details are displayed on the various tabs. 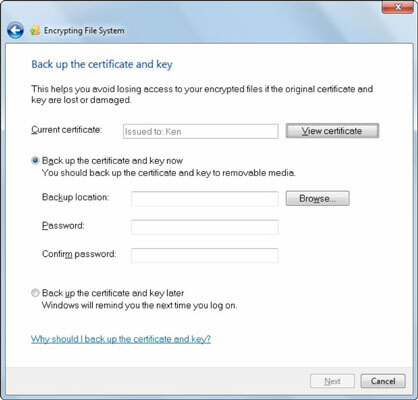 The Back Up the Certificate and Key screen appears. Select Back Up the Certificate and Key Now and click the Browse button. Browse to the location you would like to store your certificate. Give the certificate a name, enter a password, and click Next. You may want to store your certificate on a removable USB drive. 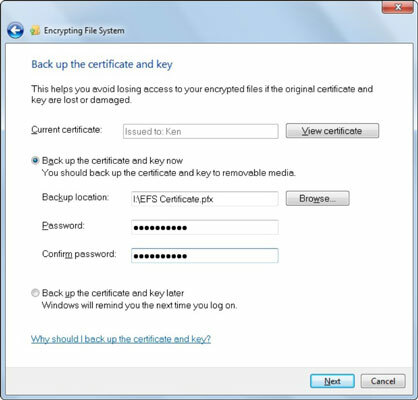 Select the individual files and folders (or the entire drive) that you would like to associate with the newly created (and backed up) EFS certificate and key. Click Next. 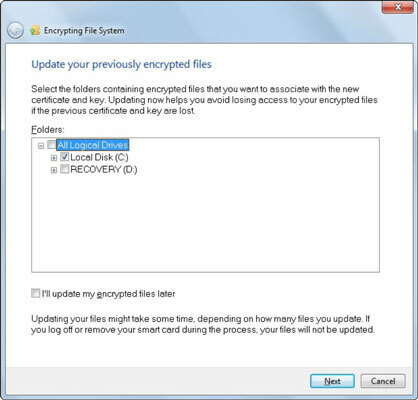 Windows updates your encrypted files and folders with the new certificate and key. This step will take some time depending on the amount of data that is encrypted.